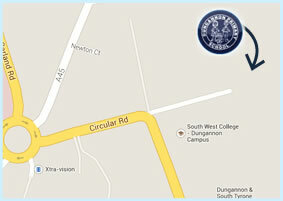 Welcome to Dungannon Primary School's Website. Within this site we have provided you with a flavour of what we do. As teachers we pride ourselves in ensuring we meet the individual needs of all the children and are confident that when pupils finish their Primary School career they have been equipped with the necessary skills needed for Post-Primary education as well as being provided with the opportunity to fulfil their full potential. 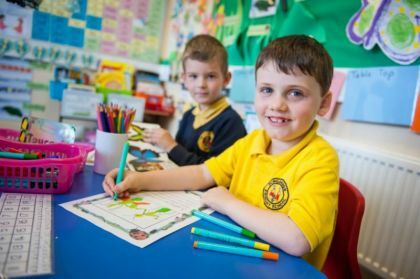 The children of Dungannon Primary School know that they come to a happy school where academic standards are high and where discipline, hard work and learning go hand in hand with respect, courtesy and kindness for each other. Thank you for the interest you have shown in our school and I hope you enjoy your visit to our site! Dungannon Primary School was nominated for two awards by the Families First organisation. The two categories were Primary School of the Year and Principal of the Year. When describing the school the judges commented on the ability of the staff as they invested in the pupils, their natural ability to be supportive and inclusive and their effortless manner when demonstrating their eagerness to ensure the school was a community based school. 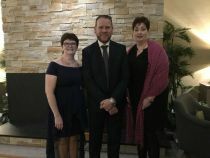 Mr Thompson and Miss Wilson were delighted to attend the awards ceremony on Saturday 10th November and were even more delighted when it was announced we were winners of both categories. As Principal Mr Thompson is very proud of all the work that takes place in DPS. Awards like these can only be obtained if the school community works together, supports one another and continues to invest in the pupils who attend. Thank you to all who forwarded messages of support.